Olympia, WA – January 12, 2016 – Fish Brewing Co. has joined forces with four south Puget Sound breweries, Three Magnets Brewing, Top Rung Brewing, Harmon Brewing, and Pacific Brewing and Malting to create the ultimate south sound collaboration beer: India Red Lager (IRL). The inspiration for this collaboration was to bring five breweries, all award winners at the Washington Beer Awards, from the South Puget Sound area together to brew a beer that not only pushed the limits of Northwest sourced ingredients, but to combine the unique elements of each brewery into one beer. South Sound IRL will have an ABV of 6.5% and 40 IBUs; will be brewed later this month. The IRL will be released in both draft and 22-ounce bottles at select retailers throughout the Puget Sound market. “We really enjoy the collaboration process. Creatively, as brewers we get to learn from each other from recipe formulation by working with new ingredients and brewing techniques. We are having a great time throwing ideas together with everyone from Three Magnets Brewing, Top Rung Brewing, Harmon Brewing, and Pacific Brewing and Malting”, says Brewmaster Paul Pearson. In the spirit of collaboration and to include the craft beer artist into the mix, we are looking for a talented artist to design a custom beer bottle label and be part of the South Sounds Beer Collaboration! One winner will be selected and the winning design will appear on the 22-ounce bottle. 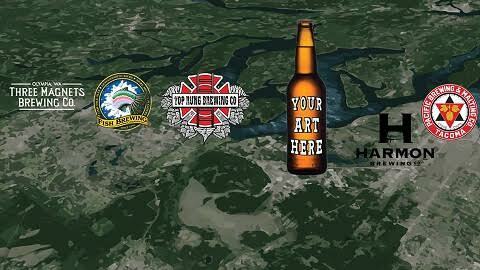 The winner will also receive merchandise from each brewery and their name will appear on all promotional materials. “We want to create a beer that reflects the true camaraderie of the South Puget Sound craft brewing industry and share that bond with our customers. Reaching out to craft beer enthusiasts and involving them in the process is another way to show our passion through our beer,” said Matt Lisowski, Operations Manager at Fish Brewing. · Contest is limited to individuals 21+ years of age. · Art must be 4.8” tall by 4.5” wide. No offensive words or graphics will be allowed and no pictures of people, renditions and original inspired works are ok.
· One winner will be selected by the collaboration breweries and the winning design will appear as the 22-ounce bottle. The winner will also receive merchandise from each brewery and their name will appear on all promotional materials. Unfortunately, state law prohibits us from rewarding the winner with alcohol. In the event the label does not conform to the requirements or any government authority denies use of the imagery provided, the collaborating breweries have the right to use the second place winner as the contest winner. · A signed release will be required by the winner allowing the use of their artwork for the sales, promotion, and production of the image in connection to the South Sound Collaboration beer. · Fish Brewing Co. has the right to alter art for the sole purposes of adding any and all required legal information on the label. This includes but is not limited to: serving size, government warning, bottler’s statement, collaboration statement, ABV, beer style, and statement of composition. Founded in 1993, Fish Brewing Company is owned by over 400 beer drinking consumers, who pooled their resources to build a landmark brewery in Olympia, WA, which is known for its quality water and artesian wells. Fish Brewing also uses when possible locally sourced Washington ingredients. Fish Brewing produces hand-crafted beers and ciders under our three core brands: Fish Tale Ales, Leavenworth Biers, and Spire Mountain Cider, which can be found in 20 states and internationally, both in bottles and on draft. Fish Brewing operates a full service pub in Olympia, WA, which was featured on the Food Networks show Diners, Drive-in & Dives, and a new taproom in Woodinville, WA. Fish Brewing believes that fresh beer and cider, fine food, and enduring friendships are what life in the Great Pacific Northwest is all about. For more information visit www.fishbrewing.com.